After studying engineering at the University of Colorado in Boulder, and disliking it intensely, I drove up to the ski town of Steamboat Springs, rented a cabin with two other people who were about my age and skied during days and worked various jobs—including as a night dishwasher at the Grand Banks restaurant on Main Street. After a few months, I left town, flew to El Paso in Texas, crossed the border by bus to the city of Juarez in Mexico and went to the train station. There I bought a train ticket for first class premium (prima de primera clase)—for $36—that allowed me to take a 36 hour train ride in my own cabin. This turned out to be the journey of a lifetime, and one that changed life. The train car was an old 1940’s American caboose, and the back door was a huge wooden door split in two. The top half swung wide open that let me look at the Mexican countryside we passed through. Mostly it was desert scrub, very littered, and often with abandoned train cars by the rail side occupied as homes by rural locals. The train stopped now and then and passengers stepped outside to buy local tamales (delicious) for a few pesos. My cabin had a bed and a toilet and was quite cozy. During the trip I finished one book and began another. Combined, these helped change perspective. Blurry photo I took of a bus ride through deforested Guatemalan jungle. We had to wait hours while these guys with massive, 6 foot long chain saws cut this tree up to clear the road. At one point I considered just walking alone, but found out later there were some bandits in the region who had actually shot at another bus we encountered. Before this trip I had driven from Steamboat to Boulder for a weekend to attend a ‘Tropical Deforestation Conference’ at the University of Colorado. It was held in Regents Hall and the keynote speaker was David Brower. 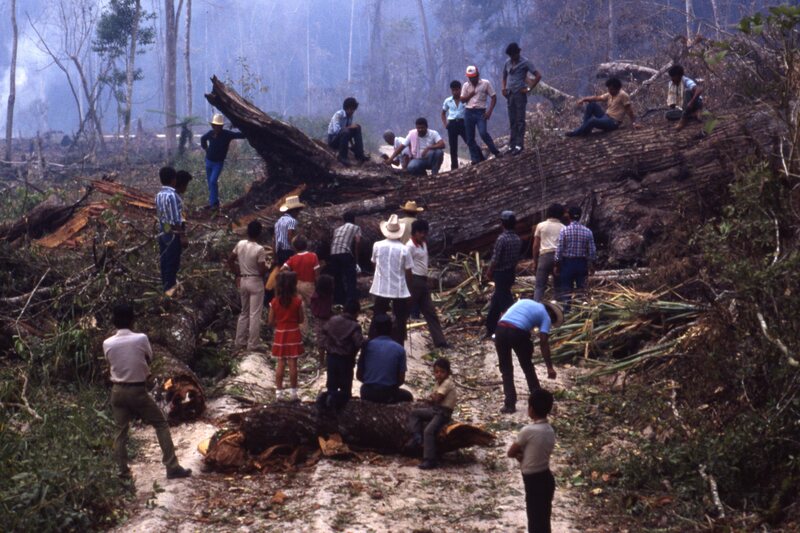 The event truly alarmed me about the state of tropical deforestation in the world. At a sales table in the hall outside this conference room, I purchased two books. I read one back in Steamboat—titled In the Rainforest by Catherine Caufield. The prose was crisp, the organization of the book admirable, and the subject matter fascinating. The second book I brought along on this train ride. Titled The Primary Source and written by Norman Myers, it also told of tropical deforestation and efforts being taken to stop it. Now and then a voice would call in the caboose hallway, and a railway conductor would pace up and down swinging a silver pail—filled with ice—holding ice cold bottles of cerveza for sale. I purchased a few, bedded down at dusk, and read. At this time I was truly agonized about what to do with my life. Stay in Colorado? Perhaps. Work in engineering? Never! I felt uncertain and almost defeated at racking my brains about what to do? I was also enchanted by the life of the author who wrote the second book, Norman Meyers. He was a worldwide environmental consultant, and a respected writer. He had a rural home in Kenya. 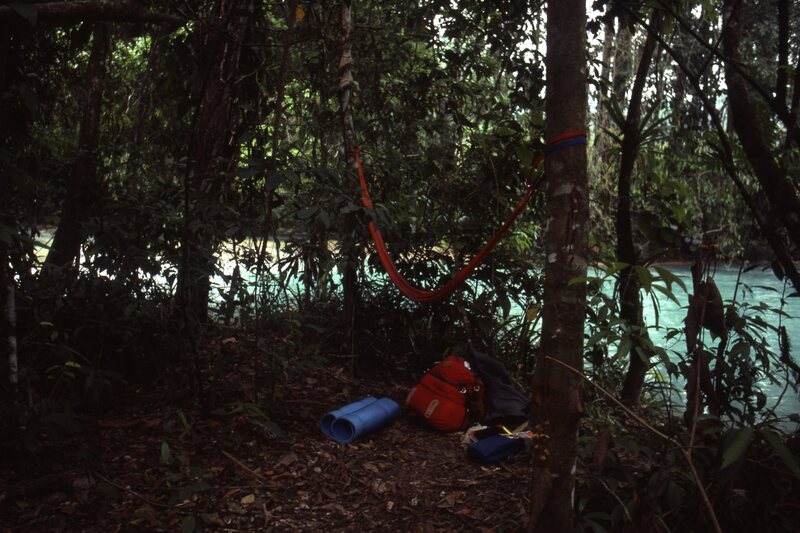 I visited Agua Azul in Mexico, found this jungle by the water and set up a hammock, where I slept the night. There were some strange noises all around me that night. During that train ride I decided what to do with life. I would become a well traveled international environmental consultant, and also an author. The years have rolled by since that train trip, as have decades. Two years after that trip I worked as a Peace Corps volunteer in Malawi, assigned as a water supply engineer. It was bliss. I had a motorcycle, a lovely English girlfriend also with a motorcycle (still a close friend) and material to write about. This led to 16 years of international work throughout the world managing infrastructure and environmental projects (and five years in southern California as an environmental consultant). I managed to self publish a few books along the way. 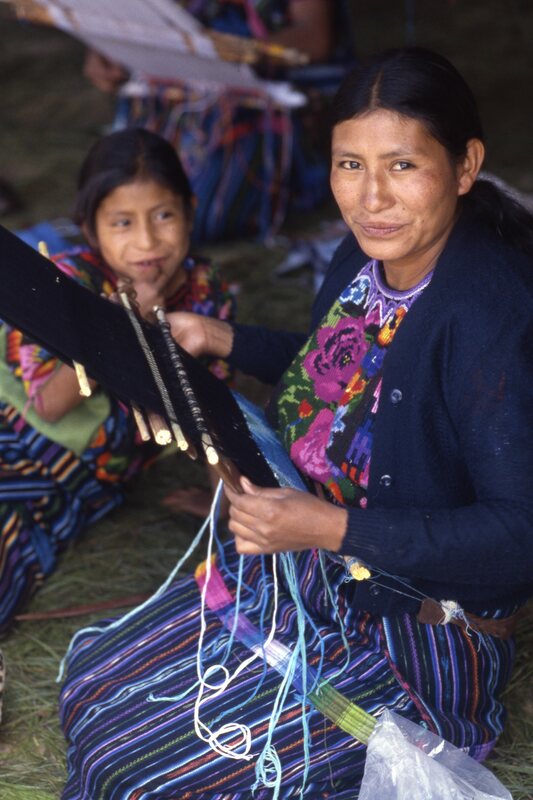 In the highlands of Guatemala, this group of indigenous women used hand looms to create beautiful shirts and tapestries. They formed a collective group of widows whose husbands had been killed by non-indigenous groups in a little known but bloody conflict that lasted years in the jungle. Recently, for the first time in many, many years, I wondered what became of Norman Myers. I found this interview with him in California in 1998. It is intriguing. He tells of growing up in Yorkshire without electricity, and then getting a job as a colonial administrator in Kenya when he was 22. My backpacking trip that followed this train ride—by train, bus, truck, canoe and plane through Mexico, Guatemala and Belize—also changed life in another way. I learned a strange truth about reality that no books or classes ever hinted at. When you confidently expect to arrive at a certain destination, events and people align themselves to help you out with your journey. Yet when you fear not making it to a destination, physical and situational realities will emerge to help block your path. That realization? Worth any course from any school.